“The cup of the chalice is silver, but at some point before Waterloo it was fixed on top of a brass candlestick – perhaps a silver base was broken or stolen. This chalice would be used to hold wine during Christian religious services, letting soldiers in the congregation take Holy Communion. Revd. Stonestreet’s name is carved into the base of the chalice. “This object reminds us of the role of religion in the life of the British Army. Many of the soldiers were Anglicans, others Roman Catholic, and yet others belonged to the flourishing Methodist church. The Methodists were treated by many, including the Duke of Wellington, with great suspicion due to their potentially revolutionary tendencies. Such activity went against the grain of social order and army discipline. “The British Army’s chaplains were all Anglican (from the Church of England), with the exception of those with the King’s German Legion and Chasseurs Britanniques (a Regiment made up of French emigrants who fought for Britain). The chaplains challenged many of the social norms of the period in seeking to assure the men of the rightness of their cause and providing religious assurance in the face of the horrors of war. Although this was a period when outward showing of religion was not encouraged, many of the soldiers held deep religious convictions and were familiar with texts of the Prayer Book and Bible. “The chaplains also engaged in visiting the sick, conducting divine worship, and attending executions, as well as providing education for soldiers’ children. An early WW1 kit packed in an oak box. 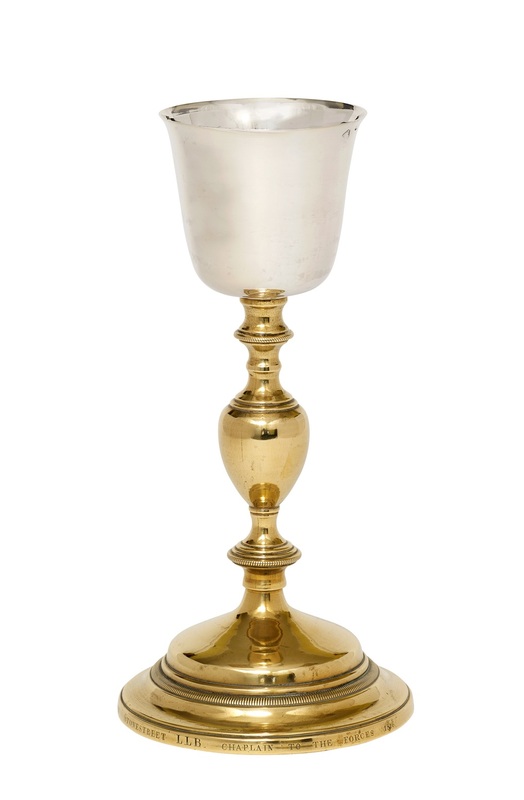 The Second chalice was used as a ciborium to serve the bread (photo courtesy Rev. Ian Walton, Chaplains at War (UK) website). Another example of the WW1 issued kit, dated 1916. 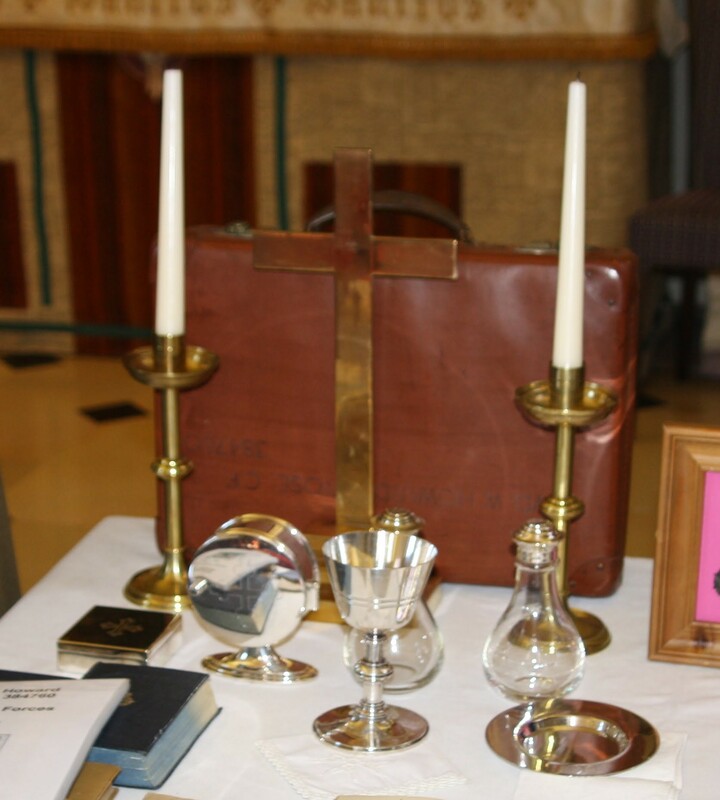 Notice the wide base on the cruets differentiating them from the WW2 issue (photo courtesy Rev. Ian Walton OSJ, Chaplains at War (UK) website). 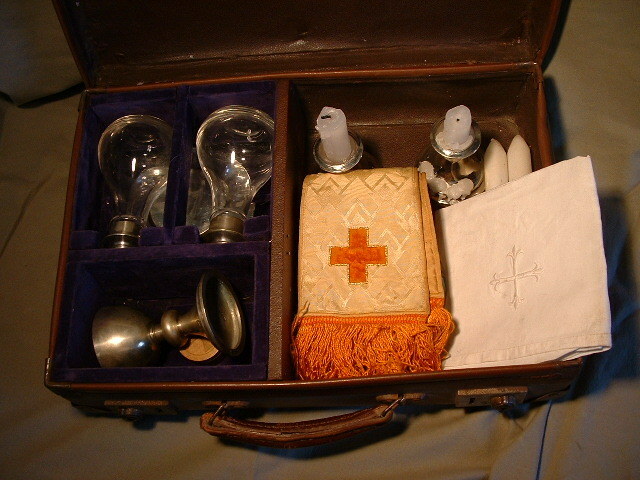 Portable Altar/Field Worship Kit/Chaplain Kit used by Padre L. E. Baumer of the 8th BN of the Norfolk Regiment in World War 1 (photo from https://norfolkinworldwar1.org/2016/03/08/the-norfolk-regiment-in-march-communion-set/;). 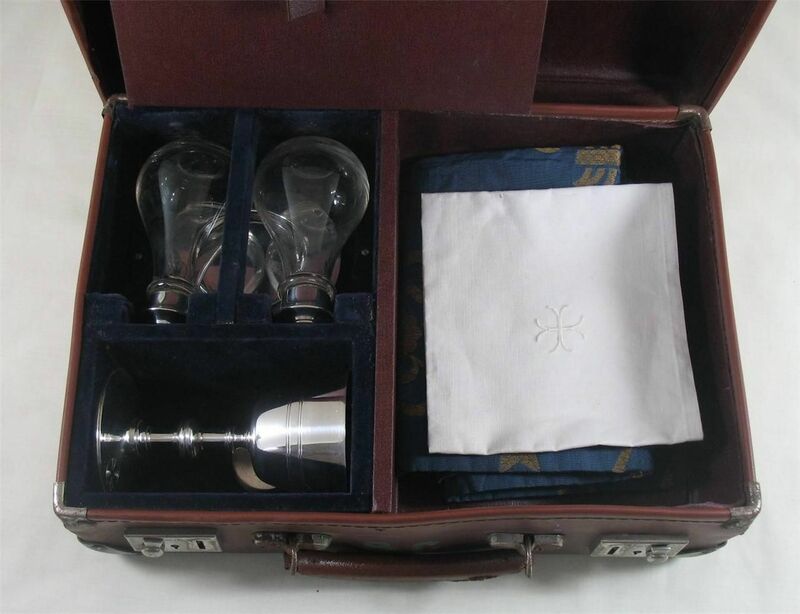 Above 1940 WW2 kit with contents stowed in case (Photo from Ebay listing). A WW2-era kit like those above, but with cross and candlesticks apparently added. Used by Rev William Howard Lvoff Rose (photo courtesy Rev. Ian Walton OSJ, Chaplains at War (UK) website). 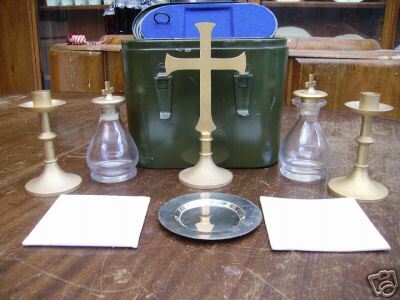 Another WW2-era kit with a different chalice than the rest and with short silver candlesticks (photo origin unknown). 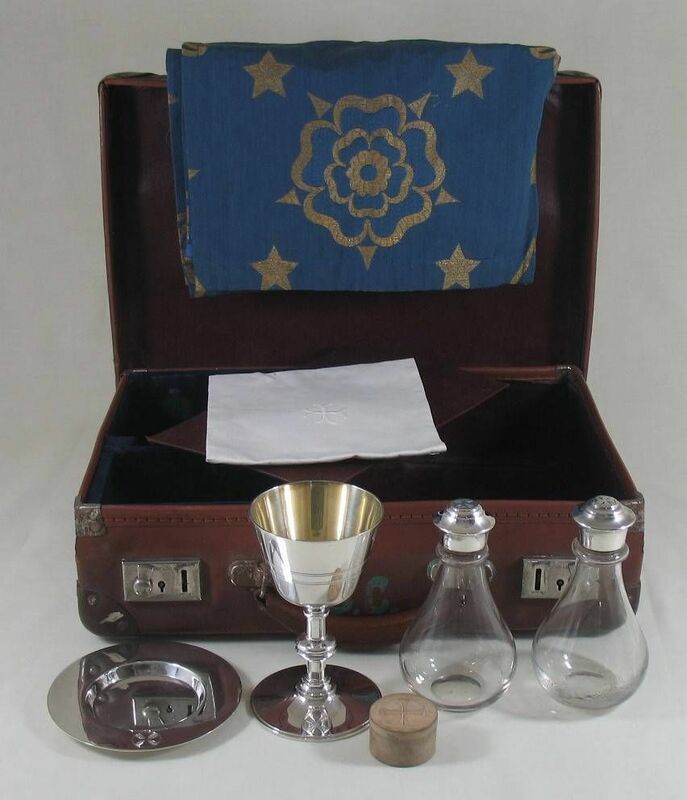 RAF Communion Set. Pieces are solid silver, issue by the Air Ministry, early 1940’s. (Photo courtesy Rev. Ian Walton OSJ, Chaplains at War (UK) website). Interesting “assembled” kit with pieces from the 1940’s and 1950’s, all with the broad arrow markings (photo origin unknown). 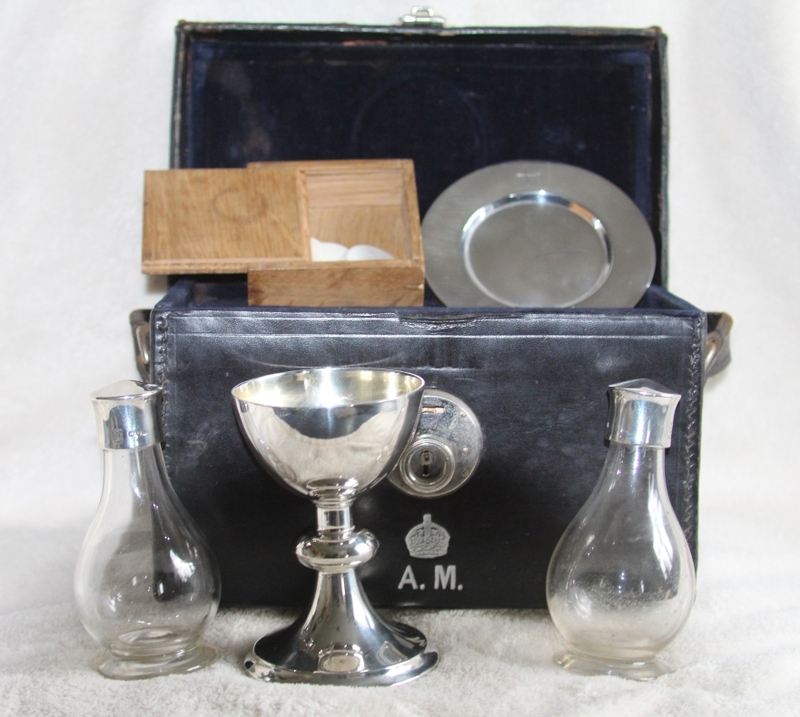 RAChD British Army Field Communion Set, 1950s. Interestingly, British chaplains in Iraq during OIF were still using these kits! (photo origin unknown).